The Pro Hear II + units come with a compact hard-shell carry case, #312 battery, cleaning tool, three size Comply Foam Tips, user’s Manual and ear plug. The Pro Hear II+ really steps up the game of aiding your hearing with a 12 band gain adjustment, three layered noise reduction and advanced adaptive feedback cancellation to add up to 22 dB of added stable gain. All of that means that you get the ability to hear the faint sounds you could not hear before with incredible clarity and focus while still protecting your hearing from loud or impulse sounds. The two channels are programmed to be responsive to a wide range of noise intensities, something you cannot get with other two channel BTE’s. The Pro Hear II+ is ideal for someone who wants high quality digital hearing enhancement to aid their hearing and provide additional protection. 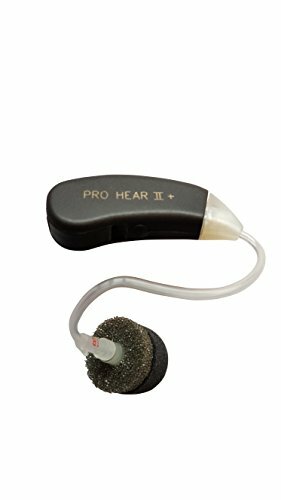 Pro Hear II+ by Pro Ears really aids hearing, whether walking in the woods, hunting or just sitting at home watching TV. Fully digital signal processing on two channels using push button select. Impulse Sound Suppression set at 85dB. Wind Screen. Adaptive Feedback Canceling. Static Feedback Canceling. Gain setting at 17 dB on channel one and 22dB on channel two. Exceptionally low THD at < 2% Typical 120 hour battery life using 312 type battery. Ultra compact size and weight, less than 1/4 oz. One year warranty. Adjustable Volume Control - rotational dial. Low battery and program change tones. We only use Ultra - soft comply Foam Tips for a secure, comfortable fit. Wide Dynamic Range Compression. Directional microphone.